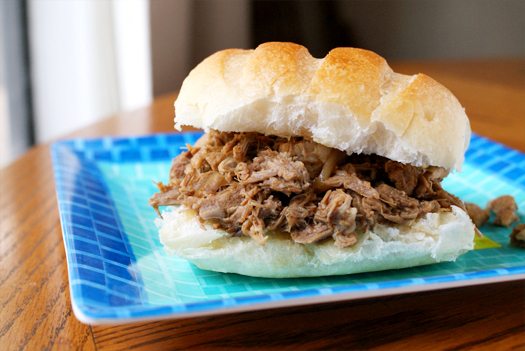 Luckily, I can occasionally get away with making my Easy Peasy Pulled Pork, which is a barbecue sauce based pulled pork. I guess because it's covered in sugary molasses based barbecue sauce, he can choke it down. Silly man. That being said, I was a little worried the day that I made this recipe. I had intended on making the barbecue sauce one he will eat and realized that I had no barbecue sauce in the house. Now what was I going to do? Improvise, that's what. I went out on a limb and made this vinegar based recipe. He was not amused when I told him it was pork, but NOT the usual kind. He grumbled all the way to the table and reluctantly started eating. Then, he kept eating. The whole sandwich. I just kept my mouth shut and smiled to myself. There will be more pork dishes served in this house. Oh, yes...there will. Even if I have to come up with a few more "forgetful" days to make it happen. If you like pork, like me, you should try this one. It's tangy, vinegary, juicy goodness on a roll. I'm salivating just thinking about it! Now, as a disclaimer, let me say that I know that in North Carolina folks take their barbecue very seriously. There is a difference between different types of barbecue by eastern and western NC. I'm just keeping it simple by calling this North Carolina style. No offense to any North Carolina foodies out there! Place the onions in the bottom of your crock pot. In a small bowl, combine the brown sugar, paprika, salt and pepper. Rub all over the pork and then place the meat on top of the onions. Combine the remaining ingredients. Drizzle about 1/3 of the mixture over the roast. Cover the remaining sauce and refrigerate. Cook on low for 8-10 hours. Remove the meat and onions from the crock pot and discard the onions. 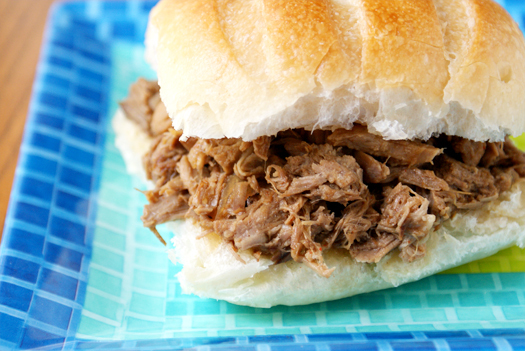 Shred the pork and return to the crock pot. Add the remaining vinegar mixture from earlier to the crock pot. We made something similar to this in the crockpot yesterday, but used pork loin and found it worked a treat, in spite of the low fat content. Just some food for thought! One of my best friends live in NC and each time I visit her, I'm sure to eat tons of Carolina bbq, hush puppies and of course drink my weight in sweet tea ;) Fantastic recipe - now I can have it at home! @abc: I would absolutely use a pork tenderloin. As a matter of fact, the only "problem" I had with the dish was when I refrigerated the leftovers, there was quite a bit of grease from the sauce that solidified on the top. Don't get me wrong, it didn't taste greasy when we ate it, it just separated as it cooled. When I reheated it, it tasted great, but using a tenderloin would cut down on the amount of fat. @Julia: Thank you for stopping by and commenting! I'll be doing the same next time I'm in North Carolina! I LOVE North Carolina BBQ. It helps that that's where both of my parents grew up and that I was born there. @Andrew: So happy you stopped by. :) You made my day! I had forgotten that you have roots in North Carolina. If you were here, I'd cook for you anytime. Miss you! Love your blog! Great recipe thanks for sharing! making this for a party but using a Nesco roaster will this work as well in that ??? needed something larger for the volume? I'm honestly not sure as I've always used a crock pot. Did you try it? How did it turn out?